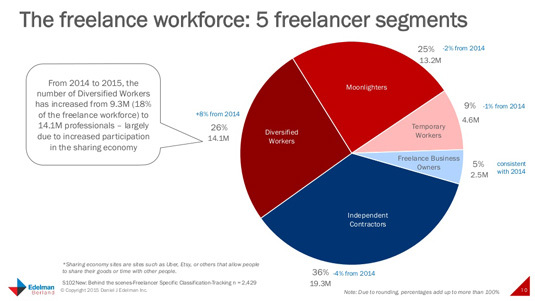 Upwork and Freelancers Union released their jointly-commissioned study “Freelancing in America: 2015” Thursday. The report includes a sizing and segmentation of the freelancer population, as defined within the study, and assesses a range topics, including freelancer motivation, earnings, attitudes and outlook for the future. This report is important for contingent workforce managers for gaining insight into this important workforce population, which will likely be a growing part of contingent workforce programs. Independent workers represent both a relatively untapped pool of skills and talent and an opportunity to manage spend and risk. According to Upwork, the above resulted from extensive multi-dimensional survey questions, not simple self-identification. The study estimates, as of mid-2015, that overall there were 53 million freelancers in the US, representing about 34% of the total US workforce. Independent contractors: These “traditional” freelancers have no employer and instead do freelance, temporary or supplemental work on a project-to-project basis. Moonlighters: Professionals with a primary, traditional job who also moonlight doing freelance work. For example, a corporate-employed web developer who does projects for nonprofits in the evening. Diversified workers: People with multiple sources of income from a mix of traditional employers and freelance work. For example, someone who works the front desk at a dentist’s office 20 hours a week and fills out the rest of his income driving for Uber and doing freelance writing. Temporary workers: Individuals with a single employer, client, job or contract project where their employment status is impermanent. For example, a data entry worker employed by a staffing agency and working on a three-month assignment. Freelance business owners: These freelancers have one or more employees and consider themselves both a freelancer and a business owner. For example, a social marketing guru who hires a team of other social marketers to build a small agency but still identifies as a freelancer. Only the diversified worker segment is growing, up 8% over 2014, while the other segments remained flat or declined minimally. However, “strong growth in the economy and the rapid increase in full-time job opportunities has led some number of freelancers to return to full-time employment,” Upwork CEO Stephane Kasriel said in an interview Wednesday. He noted that the study results showed 20 million freelancers were freelancing more out of necessity than by choice. Moreover, he referred to the study statistic that more than 1 in 3 moonlighters have considered quitting their primary employment and going solo, suggesting a migration to other freelance categories. So the picture is not as simple as it looks, he said, and we see many signs that more people are turning to freelancing for a variety of reasons. More people are freelancing by choice. Sixty percent said they started by choice versus necessity, up 7 percentage points from last year. Nearly half of all freelancers expect their income from freelancing to increase in the coming year, versus only 11% expecting decline. Stephane Kasriel noted that technology, enabling a flexible and sometimes online workforce, is source of reduced friction in labor markets – something that should be good for the economy overall. He also said that now with 60% of freelancers freelancing more by choice than necessity, freelancing is now becoming a normal part of the mainstream workforce. Positive attitudes among freelancers, measured in the study, suggest growth ahead, Stephane said, noting the study finding that 83% of freelancers believe the best days are ahead for freelancing compared to 77% in 2014. The findings of this study, even with some appearing ambiguous, seem to suggest overall that freelancing has become a rooted component of the labor market, which, driven by demographic shifts, economic factors and new enabling technology, appears primed for future growth. Even now, the independent/freelancer population represents an enormous pool of untapped skills and talent. Contingent workforce managers cannot ignore this opportunity to bring talent, efficiency and competitiveness to their companies.